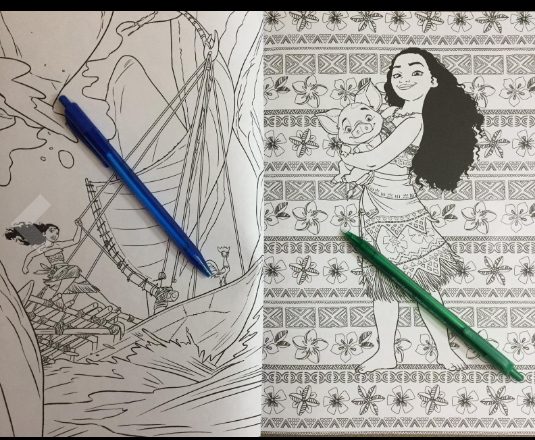 Moana and friends are the subject of this Art of Coloring book from Disney. 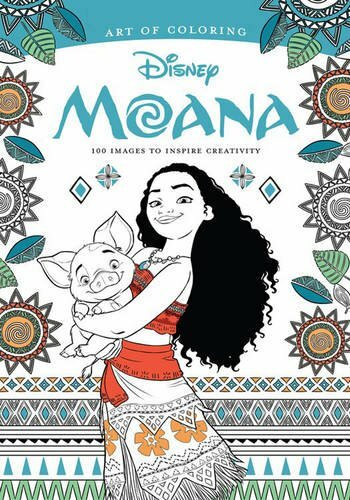 Moana fans will love the illustrations, but be aware that this book comes in the new format being rolled out for the Art of Coloring series. Most obvious is that the hardboard covers so many of us loved are gone, replaced by a typical soft cover. The format is now smaller at 10.8" x 7" inches, down from about 11.5" x 8" inches. The binding is a "lay flat" glued binding. The paper weight is noticeably lighter, and perforations have been added. These changes aren't necessarily all bad. The smaller size can be a plus if you like to scan/print onto your own paper. But the change in format definitely breaks up the look of the set and lacks the premium feel of the earlier books. The "lay-flat" glued binding really isn't any better than the old sewn binding, and in fact eliminates the ability to extract the pages by snipping the binding thread. The reduction in paper quality is truly a negative, all the more since the illustrations are printed on both sides of the pages. The paper is now of medium weight, rather than the earlier heavy weight. It is white with minimal tooth/texture. Colored pencils work quite well, but most markers and pens will either bleed through or leave shadows on the back side. The perforated pages aren't as helpful as you might think, since there are quite a few illustrations spanning two facing pages and the drawings run into the binding. But you might want to detach the pages for coloring and/or to prevent transfer of pencil pigment to the facing pages when the book is closed. 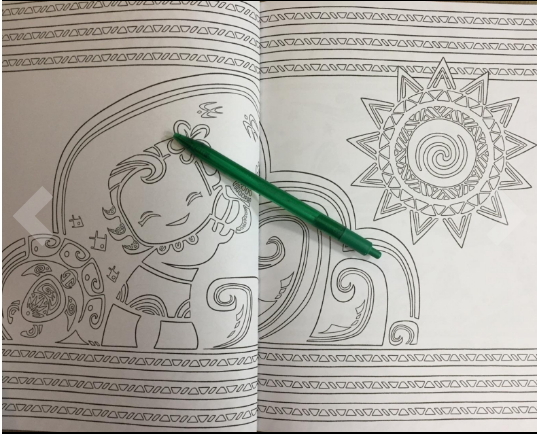 For better or worse, it appears that future printings of all Art of Coloring books will be produced in this new format. But let's move on to the art, which is arguably the most important aspect of a coloring book. The actual illustrations are very nicely done. There are a lot of really cute images of many of the characters. They happily bring back memories and images from the film. 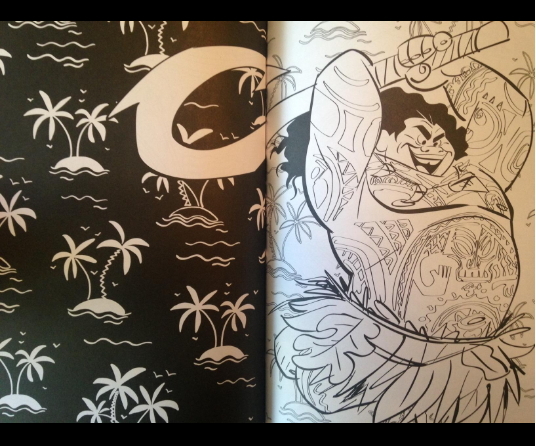 As with all the Disney coloring books there are a lot of wallpaper pages, which aren't to my liking, but after all, there are a hundred pages to fill. Too bad the wallpaper pages aren't consistently used on the back side of the character illustration pages. The designs range from detailed to simple, with a good variety of styles. It makes for a wonderful family project you can share with your kids. 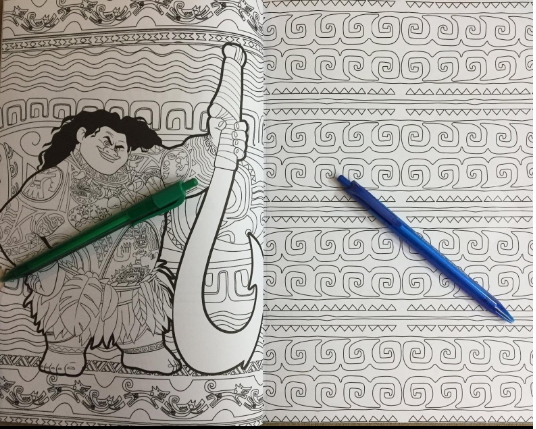 There are 124 Moana inspired drawing and 30 pages of wall-paper style repeating designs. 17 illustrations spread across two pages. If you and your family are Moana fans, don't let the little disappointments of the new format discourage you. It's still makes for a great activity with a cast of loveable characters that will be difficult to find elsewhere.